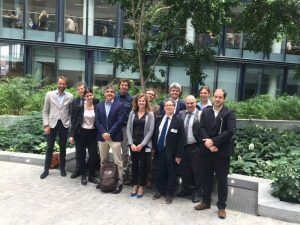 On May 24th and 25th the FIRES project was officially concluded with the review at the European Commission and the presentation of the project results in a public final conference in the Flemish Academy of Sciences in Brussels, Belgium. The review at DG Research in Covent Garden Building went exceptionally well, despite one of the reviewers being present only via Skype. The project received many compliments and only few questions and generally the Commission was impressed by the smooth management and high quality output that was delivered. This was of course an excellent start of our two day event. On Friday the project was first summarised and presented by the coordinator, Professor Mark Sanders and condensed into a 2:30 animation video that will be available on the front page of our website soon. A full report of the final conference is available here. At partner institution IFN there is also a more elaborate report here.